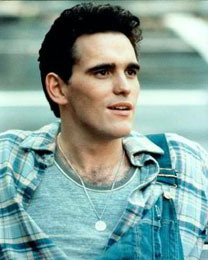 Matt Dillon was raised in a Westchester County suburb of New York, with four brothers and one sister. Most of his friends, he says, were from dysfunctional or broken families, but his parents were happily married middle-class Irish Catholics. Dillon landed in show business through pure dumb luck. Talent scouts were visiting his junior high school, scouting fresh faces for a low-budget film. Dillon was not interested when he saw the flyers, and was not planning to audition until a scout spotted him in the hallway and explained that it would be a way to ditch classes without getting into trouble. At the audition, Dillon wore a petulant "tough guy swagger" that landed him a key role in a tale of white suburban unrest, Over the Edge. He dropped out of high school and became a staple of independent films. His "teen heartthrob" era culminated with three films in a row based on novels by S. E. Hinton: Tex with Meg Tilly, and Francis Ford Coppola's The Outsiders with an all-future-star cast and Rumble Fish with Mickey Rourke. When Dillon outgrew such roles, he moved on to more grown-up assignments, among them Gus Van Sant's Drugstore Cowboy and To Die For. In Cameron Crowe's Singles, he played the lead singer of a grunge band played by Pearl Jam. His most famous role probably remains the sleazy private eye in There's Something About Mary with Ben Stiller and Cameron Diaz. He wrote and directed the 2002 film City of Ghosts with James Caan, which was poorly received at the box office and criticized by Asian activists for its depiction of Cambodian prostitutes. "They offered me some books to read," says Dillon. "Women's studies or something. I think they were being a little too politically correct." Dillon's grand-uncle, Alex Raymond, was the cartoonist who invented "Flash Gordon". Another grand-uncle, Jim Raymond, drew the "Blondie" comic strip for more than 40 years. Dillon's father, retired from a career selling packing material, is now a painter.